We need to attract and encourage and sustain a broader and more sustainable business base. Our children and grandchildren deserve a chance to raise their families in the community they grew up in. Building a more local economy would make us more resilient. Here are 10 reasons to shop local. Building on the ideas in Sustainable Cowichan will move us towards a sustainable economy. The Official Community Plan says North Cowichan will create a positive business climate -- one that promotes growth and diversity, and creates liveable wage jobs. . The last several years we have seen a more thriving local economy. One of the problems in supporting this, is housing for those employed in it. We need a clear and forward-thinking plan to address this. The Tax Revitalization By-law grants approved applicants relief from the municipal portion of their tax bill on an eligible development. And the CVRD is going to ask the people by referendum October 20th, at the municipal election, if they support a function (regional) that would give the valley skin in the game that us required to get some of the billions allocated by senior governments to build social housing, planted firmly in the regional district. 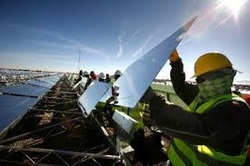 - To continue to work to attract green businesses that pay liveable wages. Our Revitalization Tax Exemption By-law has already attracted several good businesses to start, reallocate or expand this year. - To support incentives to businesses that process our resources here. - To support incentives that will help existing and emerging businesses make themselves more sustainable. - To continue to support the Municipal Forest Reserve. - Lobby senior governments to help eliminate poverty. Eliminating poverty is cheaper than reacting to it. North Cowichan has fabulous assets -- unequaled public forests, a growing network of trails, an expanding public transit system, new smart-growth standards, and resourceful people who are equal to any challenge. We are poised to become a model municipality -- a flagship community that should draw like-minded businesses and families like a magnet. We should be able to attract businesses in "hot" emerging fields, such as agro-forestry, renewable energy, local food production, technology and eco-tourism. I want to help that happen.